Computes the average of the image pixel values. The function calculates average of pixel values in the inImage. 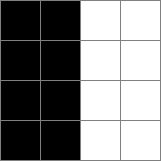 Average values of pixels calculated for each channel are returned in outAverageColor, while calculated for the region of interest - in outAverageValue. If region of interest isn't specified, average is calculated for the entire image. Connect inImage with the output of your image acquisition filter. In this single-channel image, average will be 127.5 for the channel and for the entire image (if the region of interested isn't specified). 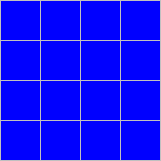 In this three-channel RGB image, average will be 0 for R and G channels and 255 for the B channel. If we don't specify the region of interest, average of the image will be 85.0 (because arithmetic mean of 0, 0, and 255 is 85.0). In this three-channel RGB image, average will be 63.75 for R and B channels and 127.5 for the G channel. If we don't specify the region of interest, average of the image will be 85.0 (because arithmetic mean of 63.75, 63.75 and 127.5 is 85.0). The input image shouldn't be empty. The input region of interest shouldn't be empty. DomainError Empty image on input in ImageAverage. DomainError Empty region of interest on input in ImageAverage. 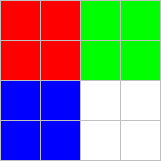 ImageAverageHSx – Computes the average of the HSV, HSL or HSI image pixel values. ImageMaximum – Finds the location and the value of the brightest pixel. ImageMinimum – Finds the location and the value of the darkest pixel. ImageSum – Computes the sum of the image pixel values.